The heart is the body organ that constantly circulate blood to all the parts of the body. The organ is situated beneath the rib cage, a little left of the breastbone and between the lungs. This organ pumps oxygenated blood to all parts of the body. Its size is slightly bigger than a clenched fist. This vital organ normally beats for about 72 times per minutes. It beats for around 100,000 times in a day, and over 30 million times in one year. Every beat sends oxygen rich blood throughout the body. This blood is rich with oxygen and nutrients to feed every cell in the body. Over 2000 gallons of blood is pumped through the blood vessels which branches and crosses as they link to our body cells. It composes 4 chambers which include the atria-2 upper chambers and ventricles-2 lower chambers. These chambers are the right atrium, right ventricle, left atrium and left ventricle. Every chamber has one way valve at its exit. Each of these valves prevent any blood from flowing rearward. Whenever a chamber contracts, this valve at the exit opens, and it closes when contraction ends thus preventing blood from flowing backwards. 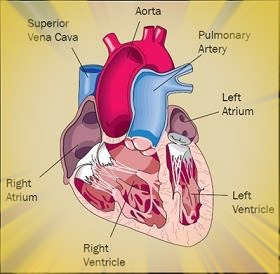 The valves at the exit of the four chambers are mitral, aortic, tricuspid and pulmonary valve. Each of these valves opens in one way only, when pushed. Each of these valves opens and closes one time per every heartbeat. As the blood is pumped through the blood vessels, the function of the left and right side separate and different. Blood from all over the body enters the right atrium. When this atrium is filled up, it contracts and pushes blood to the right ventricle. This right ventricle then contracts and sends blood to the lungs where carbon dioxide is emitted and oxygen is absorbed. The left atrium then receives oxygen-rich blood from lungs. This blood is emptied into the left ventricle. From here it is pumped to all the parts of the body. Arteries- These carry oxygenated blood to all the tissues in the body. They divide and become smaller as they move toward body tissues. Capillaries- These enables exchange of oxygen, water carbon dioxide, waste chemicals and other nutrients between blood and tissues. Veins- These vessels carry blood from the capillaries. This organ is key in the circulation system. It contracts repeatedly to pump blood all over the body. The organ pumping is caused by an electric flow that repeats itself in cycles. Whenever this electrical flow is interrupted, it affects the ability of this organ to pump blood normally. We now know that this is indeed an important organ in our bodies- no one can live without it. This organ is simply just a pump- and I believe you know what a pump does; to propel or drive something from one point to the other. Just like other pumps, this organ can get blocked, or it can break down. Thus whenever these happen it needs repair. Therefore we need to know how this important organ works. If you have some information on how this organ functions or what is bad or good for it, you will considerably reduce your risk of related diseases.